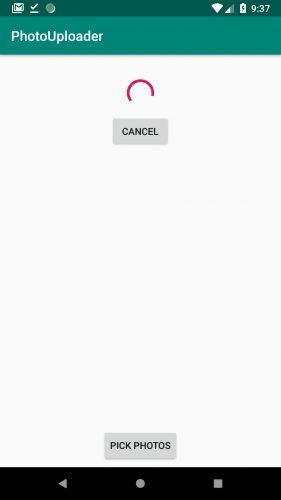 At Google I/O 2018, Google announced the WorkManager library as part of the Android Jetpack component set. Moving forward, WorkManager replaces JobScheduler as Google’s recommended way to enqueue background tasks that are guaranteed to execute. In this WorkManager tutorial, you’ll learn about the different types of background work and their respective uses. You’ll also implement a series of workers, each performing a different task. Finally, you will connect the tasks together using WorkManager task chaining. Background work is any app-related task that is not executed on the Android main (UI) thread. Usually, you need to execute on a background thread because the task is an expensive operation — like applying filters to a bitmap — or the task depends on a network request to query or post data. Because you don’t want to block the main thread, or you want the task to continue running even if you close the app, you dispatch the task to a background thread. On the left, for tasks that don’t need a guarantee of execution, you can use ThreadPools, RxJava or coroutines. On the upper right, for exact timing and guaranteed execution, you should use a ForegroundService. On the lower right, for deferrable and guaranteed execution, you have several options: JobScheduler, Firebase JobDispatcher, and Alarm Manager + Broadcast receivers. WorkManager falls into the category of guaranteed execution and deferrable. Since Android Marshmallow, the Android team has started to put more focus on battery optimizations. The team introduced Doze mode and, later in Android Oreo, it introduced background service limits — just to mention a few. With Android Pie, the team continues to give attention to optimization and introduce new changes. Until now, to perform background work, developers not only had to know about these battery optimizations, but also had to choose between the many ways to implement the work. Internally, WorkManager uses the existing mentioned options to perform background work: JobScheduler, Firebase JobDispatcher, and Alarm Manager + Broadcast receivers. Depending on the configuration of a given device that your app is installed on (OS version, Google Play services availability, etc. ), WorkManager will choose an appropriate option and execute the work when it considers the optimum time to do so. In doing so, WorkManager provides a simple and clean interface and “hides” the complexity of deferrrable but guaranteed background work from developers. As was previously mentioned, WorkManager falls into the deferrable guaranteed execution category of background work. Uploading files to a server. Syncing data to/from a server and saving it to a Room database. Sending logs to a server. Executing expensive operations on data. In this tutorial, you’ll learn how to execute these types of background tasks using WorkManager. Apply a sepia filter to each image. Upload the .zip file to a server. Currently, tapping on the “Pick Photos” button will let you pick one or more photos from your library. After that, it does nothing. You’ll write code to add the featured mentioned above to the app. MainActivity.kt: This is the main screen with a Pick Photos button. ImageUtils.kt: Contains the aforementioned operations that you’ll execute in the background. Note: At the time of the writing of this tutorial, there’s an alpha04 version. However, parallel and chaining WorkRequests (to be explained later) won’t work. This is likely because the library is still alpha. That’s all the setup you need to start using the library! WorkManager: This is the main class that you’ll use to enqueue WorkRequests. Worker: You’ll need to subclass this to perform the task that will run in the background. WorkRequest: This represents the request of the task that will run. You’ll set the task through the Worker subclass. You can also specify constraints — for example, only run the task if the device has Internet connectivity. There are two main types of work requests: OneTimeWorkRequest, which executes the task just one time, and PeriodicWorkRequest, which executes your task periodically. The period of a PeriodicWorkRequest can be customized. WorkStatus: Whenever you need to know the status — running, enqueued, finished, etc., for example — of a particular WorkRequest, you can ask the WorkManager for it. It will provide a LiveData object containing one or more WorkStatus objects. For your first background task, you’ll create the FilterWorker. This worker will receive the URIs of the selected images and apply a sepia filter to them. Note: In the following snippets, file imports won’t be shown, as you’ll be focusing on the actual code required to implement tasks. 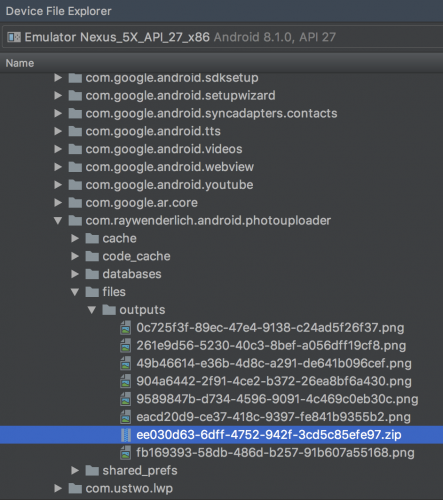 The worker-related imports start with the package androidx so, when importing, make sure you choose the correct one. private const val LOG_TAG = "FilterWorker"
const val KEY_IMAGE_URI = "IMAGE_URI"
const val KEY_IMAGE_INDEX = "IMAGE_INDEX"
private const val IMAGE_PATH_PREFIX = "IMAGE_PATH_"
Each worker has to extend the Worker class and override the doWork method, which returns a WorkResult. The result can succeed or fail, giving you feedback on the final outcome. Since the work being done can end with an exception, you’re wrapping the calls in a try-catch expression, and using the Kotlin single-line function syntax to return a value as the last line in each block of the try-catch. You’ll see how this URI will be used in the next worker. Also, by returning a successful case, you notify that this worker has done its job without any issues. If there’s an exception, you return a failure to stop the work. Note: inputData and outputData are just key-value maps. However, there is a 10KB limit for the payload. After the images are selected and returned, you wrap each into your FilterWorker using the buildSepiaFilterRequests() method that you’ll add next. Then you retrieve the WorkManager instance, and you begin your chain of tasks by applying sepia filters. In the end, you return all the requests you’ve prepared and run them all at once. Notice how they are each a OneTimeWorkRequest, meaning that this work will run once and clean up. Having finished all of that, you’re ready to try out the filters and see what you get! 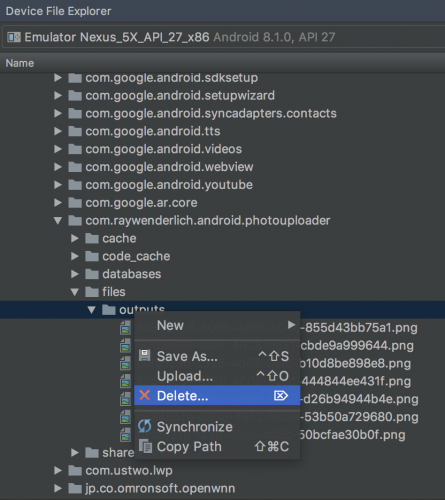 Run the app, pick one or more photos and then, after a few seconds, open the Device File Explorer via the following Android Studio menu: View ▸ Tool Windows ▸ Device File Explorer. 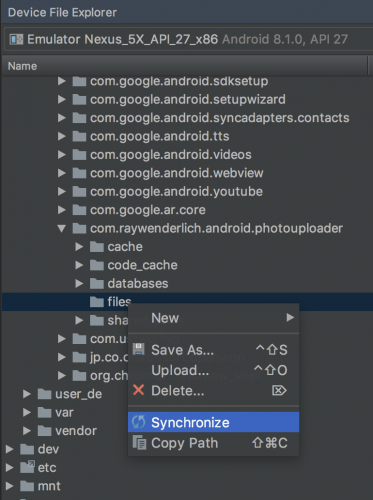 Navigate to the /data/user/0/com.raywenderlich.android.photouploader/files/outputs folder. Note: On different emulators, there are different output folders. So if you cannot find the /user/0 folder, try looking up /data/data. If you want, you can delete all the files with the Device File Explorer but, later on, you’ll create a worker that cleans these files. After applying the sepia filter to each selected image, you’ll compress them into a single .zip file. private const val LOG_TAG = "CompressWorker"
private const val KEY_IMAGE_PATH = "IMAGE_PATH"
private const val KEY_ZIP_PATH = "ZIP_PATH"
This worker is simpler than the last one and only consists of two steps — finding the images and zipping them. The .zip file path will then be passed along to another worker. But, for now, you’ll connect the two existing workers to create a chain that applies a filter and then zips the images. You’ve combined the zip compression with the sepia filter code. After you created a CompressWorker zipFiles, you chained it with the sepia filter worker by calling .then(zipFiles) on the workManager instance. You can chain arbitrary amounts of workers this way, and it’s really simple to do so! Also notice how you don’t need to pass any arguments to the CompressWorker, because of the inputData and outputData constructs. When the first worker finishes, whatever output it passed on gets propagated to the next worker in chain. Run the app again. 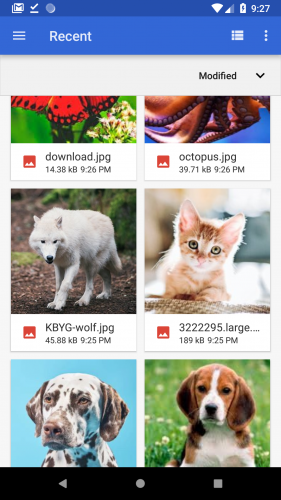 Select one or more images and, after a few seconds, check in the app files with Device File Explorer. Now, you should also see the .zip file. Next up, you’ll clean the directory. Additionally, after generating the .zip file, you’ll upload it to a server. private const val LOG_TAG = "CleanFilesWorker"
This worker is pretty straightforward; it simply calls ImageUtils to clean up the files. private const val LOG_TAG = "UploadWorker"
UploadWorker is simple, too; it parses the .zip file path and tells ImageUtils to upload the final product. Note: Since the UploadWorker needs to upload the file somewhere, you need a file server to be running. You can do this in two different ways: run one locally or upload to a shared service. Both options are ready for you. There’s a shared service running to which you can upload at any time. If, however, you prefer to upload locally, you can use the prepared local version of a file server. To run the local version, you need to install NodeJS, and then navigate in the terminal to the server folder, found in the materials you downloaded. Execute the command node app.js, and everything should be up and running. Depending on the chosen server option, open ImageUtils.kt and comment out one of the two SERVER_UPLOAD_PATH constants and uncomment the other one. The one containing 10.0.2.2:3000 is used for local server, while the other one is the shared service. Feel free to change the local server IP address to something else, if you’re using a real device. If you are running the server locally, you can open a browser and go to http://localhost:3000/files/Your-UUID-string.zip to download the file. Replace the existing sequence with the new one. Just ignore the new one and keep the existing sequence. Append the new sequence to the existing one. private const val UNIQUE_WORK_NAME = "UNIQUE_WORK_NAME"
By calling beginUniqueWork(UNIQUE_WORK_NAME, ExistingWorkPolicy.REPLACE, cleanFiles), you’ve started unique work and decided to use the REPLACE policy. This means that, each time that you click the Pick Photos button and select one or more images, WorkManager will replace the existing sequence of WorkRequests and start a new one. getStatusById(): Use this to get a LiveData object containing the WorkStatus for the WorkRequest with a given ID. getStatusesByTag(): Returns a LiveData object containing the list of WorkStatus objects for the specified tag. This is possible because you can tag multiple WorkRequests with the same name. getStatusesForUniqueWork(): This will also return a LiveData object containing the list of WorkStatus objects that have the same unique work name. private const val WORK_TAG = "WORK_TAG"
getStatusesByTag() returns a LiveData object to which you attach an Observer. When you get an update on the status from the WorkManager, you check if it’s active or not. Since you’ve tagged only one worker, you can take the first item from the list (if it exists) and check its state. If it’s not finished, you show a progress bar and a cancel button. Otherwise, you hide them. Now, at the bottom of the onCreate() lifecycle method in MainActivity, add a call observeWork(). Build and run the app. Once you start uploading images, you’ll see the progress bar and the cancel button. The cancel button doesn’t do anything yet, but you’ll fix that soon. Unique work: If you started unique work with a unique work name, then you can just call cancelUniqueWork() and pass the name as parameter. By tag: When you tag one or more WorkRequests, you call cancelAllWorkByTag. By ID: If you have the ID of the WorkRequest and want to cancel it, you call cancelWorkById(). Since you’re using unique work, you’ll cancel it using the unique work name. Build and run the app, select some photos and then cancel the work requests using the cancel button. Some work cannot be done without a certain set of conditions. For example, work may only run if your device is not low on storage, is charging, etc. You can add constraints like these to any of your tasks. It makes sense to add a network-related constraint to the UploadWorker, because you cannot upload unless there is a stable connection. 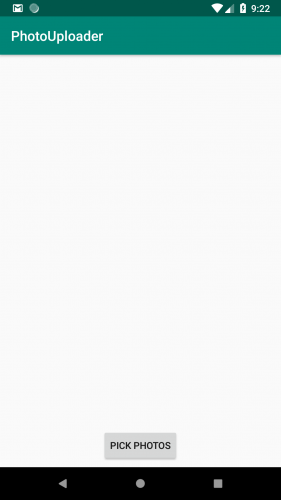 As you can see, you’ve configured the upload request to only run if the device is connected to the network, otherwise it will not run until the condition is met. This is really convenient because you don’t have to implement the connection listeners and do the checks yourself. Run the app. Set the emulator/device into Airplane mode. Pick photos from your library and open the Logcat console. You should see that the UploadWorker will not run (filter the console for onResponse like you did before and check the timestamp on any results). Only after it receives a network connection will it upload the file. You can make sure this happens by taking a look at the console once again, after disabling Airplane mode. Congratulations! 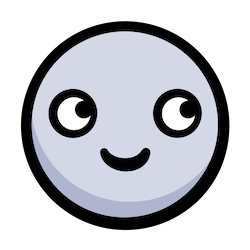 You’ve just learned the basics of WorkManager. Feel free to share your feedback, findings or ask any questions in the comments below or in the forums. I hope you enjoyed this tutorial on WorkManager! 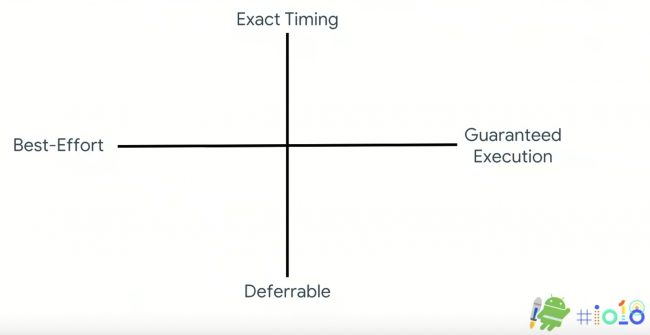 How to define measurable (and practical) KPIs for a QA Manager?